Finding pretty plants that bloom in the shade can be quite a challenge! The garden in the front of our house faces north, so it gets very little direct sun except at the peak of summer. As a result, most plants become scraggly or die. I could replace them all with boring green hostas and ferns, but I desperately wanted to fill the front of the house with beautiful flowers for maximum curb appeal. Before spending a ton of money on new plants that might not make it through the summer, I did some research to find the best ones for this tricky area. This post contains affiliate links. See my disclosures page for more information. The White Giant calla lily planted by the previous owner was the only thing that thrived in this garden bed. These tropical-looking flowering plants grew over 4 feet tall with flowers as big as my hand! I need to come up with a sort of structural support system for the flower stems because they tend to get top heavy and droop when they reach their maximum height. I split the big plant into three smaller ones and planted them at the back of the garden, so they can cover the foundation with their thick foliage. 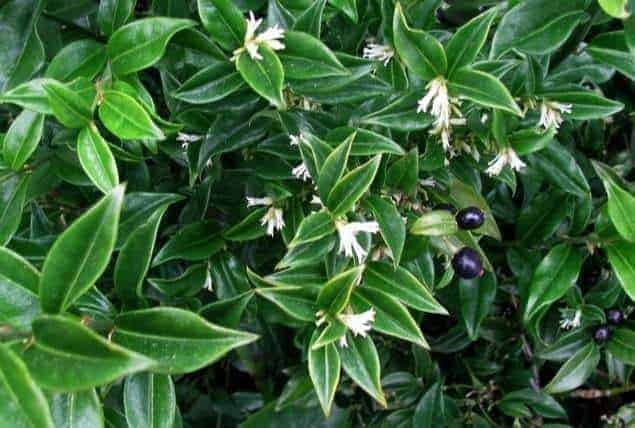 Himayalan Sweetbox is a winter blooming evergreen shrub that grows to only 18″ tall, but spreads out to 3 feet. It has a beautiful fragrance when the little white flowers are in bloom. I planted a group of these at the corner of our concrete front steps to soften the hard edges and give us a whiff of spring in late winter. 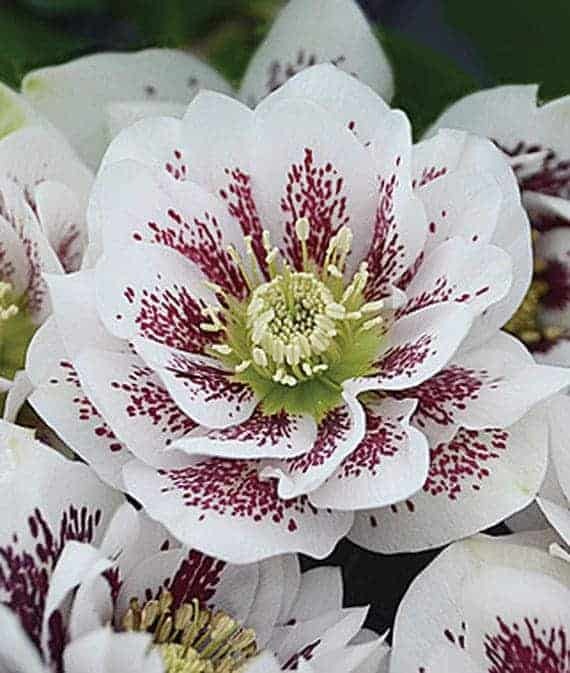 If you want to add some color to your shade garden in the colder months, hellebore is the perfect choice. These beauties bloom in late winter or early spring, and come in a variety of colors. We don’t get snow here in Seattle, so I’m looking forward to seeing these flowers pop up every year in February to remind me that spring is coming. 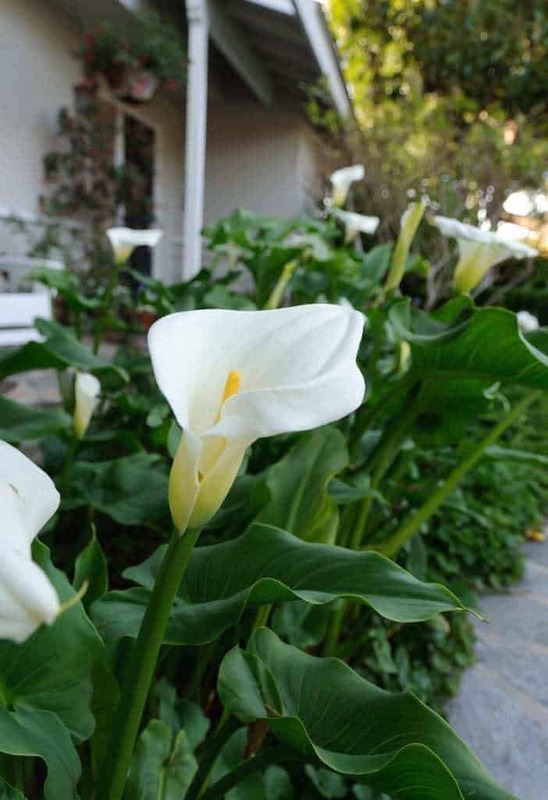 A row of these are going in front of the calla lilies so the garden doesn’t look so bare in the winter. Begonias are another beautiful shade-loving flower that comes in lots of bright colors. The double bloom variety resembles roses, but you would never find a rose in the shade! Begonias grow very well in containers. I planted a few in our front porch planter, and by July it was growing like crazy! 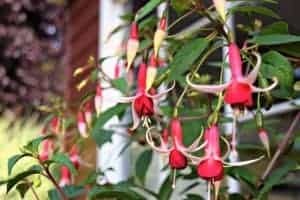 Fuchsia is an exotic looking shade plant that is great for hanging containers. The drooping flowers also make great “spiller” in a larger container. I planted fuchsia in the same container as the begonias you see above. Some of the longer stems are staked upright, while others are allowed to gracefully hang from the edges of the container. This combination is a winner! Impatiens would be great as a border plant in a shade garden. 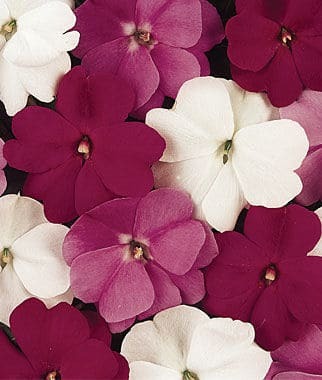 You can plant these little gems close together to create a solid band of color at the front of the flower bed, and they will continue to bloom from spring until frost. 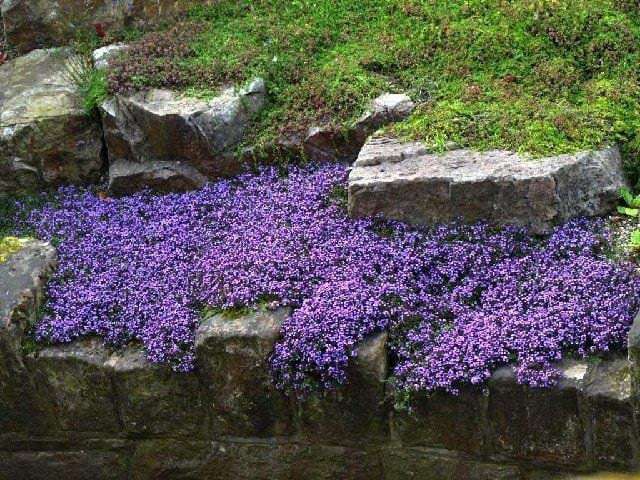 Creeping Myrtle is an evergreen ground cover that sprouts little purpley-blue flowers in spring. I planted these under a tree that provides a lot of shade in the summer last year, and they’re filling in that empty space nicely. I’ve read that these can get a little crazy spreading through your garden, so make sure to trim them back if they start growing where you don’t want them to go. All this talk about flowers makes me want to get out there and get my hands dirty! Too bad the forecast for the next week is nothing but rain, rain, rain. We had a few sunny days last week, and I managed to get the winter and early spring plants in the ground. The begonias and impatiens are on order and will arrive when the time is right to plant them. I’m really looking forward to having some beautiful color in front of the house, and I no longer need to worry about whether the plants are getting enough sun! If you would like to keep up to date with my latest posts about home improvement, gardening and more, you can follow me on Facebook, Pinterest, or sign up for my weekly newsletter below. Great collection, just what I was looking for! Hey! 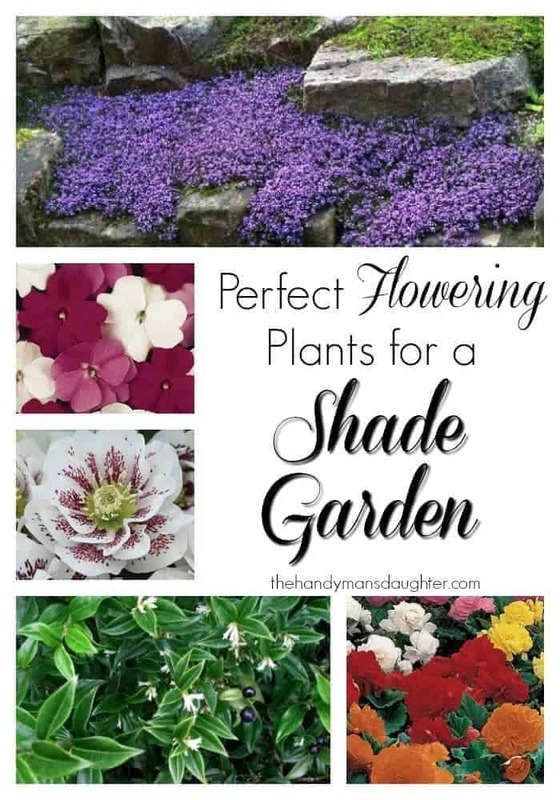 I found you on the pro blogging and biz fb group and your site caught my eye because I’m in need of shade plants this spring… the front of our house faces north too. Thanks for the great ideas! I’ll have to check out your blog a little more because I also have a hideous ’80s dresser that needs some updating. 🙂 If you want to check out my blog. it’s http://www.widemeadow.com, and I blog about simple ways to eat healthy and live naturally. What kind of flower can I plant that is colorful and will bush out enough that you can see from the road. When it rains its get a lot of water in that area. A rhododendron might be a good choice. They like partial shade, and moist soil. We have a few around our house and they look so pretty in the spring, and they’re evergreen so you’re not looking at a leafless bush of twigs all winter. Your garden is lovely! Will you come plant mine? LOL We have alot more shade than I thought we did in our yard. Love your ideas, especially the callas and begonias:) Sharing on FB and pinning! Thanks Wendi! My garden is definitely a work in progress, but it’s getting there. We have a lot of shade, so it’s been tricky finding plants that are happy there. 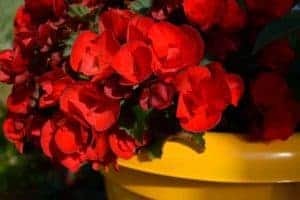 Great article, my wife sent me this article saying I should have added “planting flowers” as a task for spring cleaning on my handyman site, http://handyjak.com. Maybe she can be in charge of that part :). Thank you for all your great ideas. Hi Vineta, I read your blog. It shows a good thing that the different color can create a glorious look. I liked your post. I will definitely apply it in my garden. Thank you for give me a wonderful idea. i wish you could come to tennessee and help me with my garden (or lack thereof). i am a bit overwhelmed/paralyzed by all the options out there but so want to create a beautiful look around our home. i love the more “romantic, unstructured” look (english cottage-y maybe?) but am not sure how to make that work in the small flower bed right up against our house on the north side. any suggestions? it gets maybe 3-4 hours of sunlight at most. Most of these plants would work for the north side of your house. Mix in a few hostas or ferns and you’d have the start to a beautiful garden. I have creeping myrtle under our Japanese maple tree, right next to the lawn, and it hasn’t taken over the grass at all. If it starts heading in that direction, it’s easy to just pluck that strand up and reposition it. Hope that helps!